I love antiquing. I look mostly for small sewing tools and shuttles. I do come across tatting once in awhile. When the price is reasonable, I will always rescue tatting and other laces. 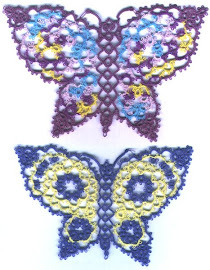 This is a picture of what I did with some rescued tatting I've found. The back of the vest is all rescued tatting. The front has some rescued tatting and some projects from various tatting classes I've had over the years. Last night I spent most of the night updating my website and figuring out how to get it verified so google will recognize it on a search. Learning all this new stuff is sure time consuming. I still have quite a bit of information left to put up, especially on Dora Young, but it's getting there slowly but surely. Very nice Heidi!! 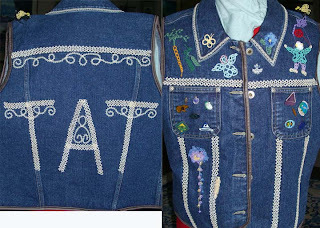 I really like how the vest looks and that you have used some antique tatted pieces on it too. Very creative!! I like the curly q's you added. How did you do that? Great use of old lace.